My kitchen is in desparate need of a remodel. I dread the process - all the decisions, the mess, and the expense. But let's face it, it's time. The last update was circa 1969 when the previous owner lived here. The counter is cracked, the floor tiles slide out from underfoot and the plaster walls have a lovely pattern similar to swiss cheese. To push myself to actually get on with it, I am committing every Frieday's post to some aspect of kitchen remodelling, whether that be my horror stories (as I am sure there will be) or pretty pictures and clever ideas to inspire. As my kitchen cabinets are in good condition, but need to be refinished, I thought I'd start by looking at ways to consider using chalkboard paint. Both of these projects are from Better Homes and Garden. Benjamin Moore offers custom colors in chalkboard paint, so I am not limited to black, black and more black. What about robin's egg blue?! 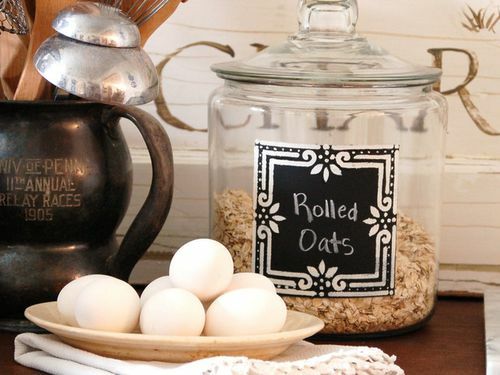 I love their use of it on containers for the garage, but the idea could easily translate to the pantry like this cute container update from HGTV. Painting your fridge with chalkboard paint is perfect for doodlers of all ages. My favorite use is on the backsplash. Here is a transformation featured on Design Sponge several years ago. Oh yes, I could do that!